In this example, we are going to collect system stats with collectd and pass them to InfluxDB where they will be stored. We will then use Grafana to visualise stored data. We will be using collectD version 5.5.1, InfluxDB version 1.3.5 and Grafana version 4.4.3. I assume that you already have InfluxDB and Grafana installed. If you want to know how to install them, you can read the previous post called "InfluxDB and Grafana integration" under LINUX category of this blog. As shown below, I have two vagrant boxes setup as servers. Server 1 (192.168.50.20) - Where stats are collected and transferred to InfluxDB by collectd. Server 2 (192.168.99.30) - Where stats are stored by InfluxDB and visualised by Grafana. The server 1 must be able to communicate with the server 2 over UDP port 25826 which is what collectd will use to transfer data. Check if the communications is working. If it does work, you should see something like below. 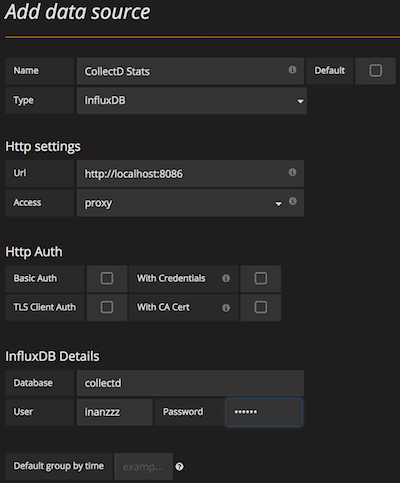 We first need to prepare InfluxDB in order to interact with collectd so do the following. server-2:~$ curl -i -XPOST http://localhost:8086/query -u inanzzz:123123 --data-urlencode "q=CREATE DATABASE collectd"
Find [[collectd]] in /etc/influxdb/influxdb.conf file and make it match settings below. CollectD is used to collect system metrics periodically and can send them to data storages such as InfluxDB etc. By default collectd monitors CPU, memory, interface, load and some others but you can configure it to monitor whatever you want it to monitor by using relevant plugins. By default there are many plugins enabled but we will just watch cpu, disk, load, memory, processes, swap and users stats then disable remaining plugins. Note: When you disable plugins, make sure to disable associated code blocks if there is any. For example df and rrdtool needs disabling. In addition to above, enable LoadPlugin network then add block below to the bottom of the page. Let's just check what we have in collectd database. Save it as "CPU stats" by clicking disk icon on top of the page. This will produce graph below.